On November 24, Viennese audiences will be treated to the world premiere of Judith Lang Zaimont’s Pure, Cool (Water) Symphony No. 4, performed by the Janacek Philharmonie Ostrava at the Wiener Konzerthaus, conducted by Niels Muus. 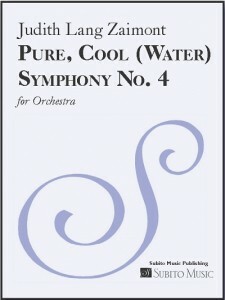 Commissioned and supported by The Sorel Organization, Pure, Cool (Water) is a 43-minute work written in honor of the composer’s late father whose career as a chemical engineer helped provide international communities with quality resources for drinking water. Pure, Cool (Water) is structured in five movements: “The River,” “Ice,” “Rainshower,” “The Tarn,” and “Ocean;” and, each movement can be excerpted and performed individually.